Stone was the one hard and easily found material the Indians had. So they used it to make tools. 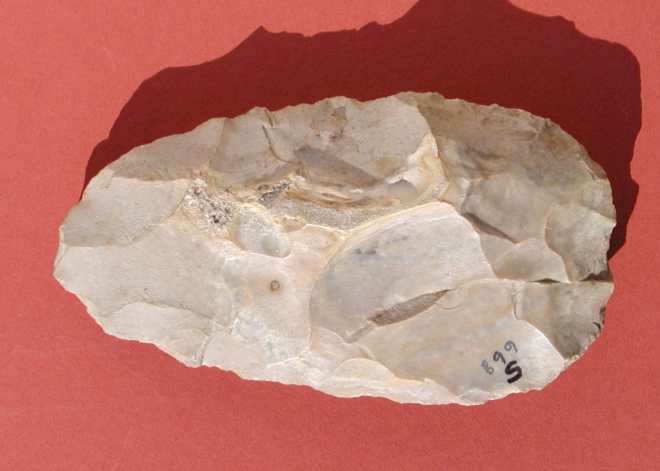 Most stone tools were shaped by chipping. But, many were shaped by grinding them with abrasive stone or sand. The chipped stone is usually chert or flint of one type or another. 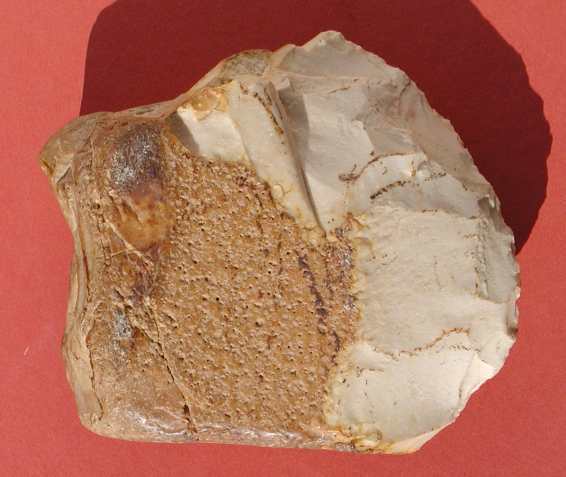 Chert is a stone with glass-like qualities. When chipped it leaves a smooth surface. It also leaves a very sharp edge. 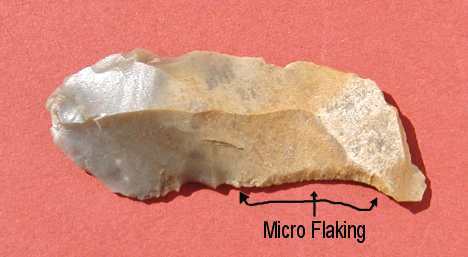 Flakes from good quality chert are as sharp as the sharpest razor. Not all chert is the same. It varies in color and quality. A preform is an unfinished tool - a blank set up to make something out of. People often confuse a preform with a finished tool. They can tell it is worked stone. And a preform can make a pretty good chopper if needed. We find two kinds of preforms. One type is discarded preforms. While chipping out the preform, the Indian found a flaw inside the stone that made it unworkable to make a tool and so threw it away. The other kind is a sort of blank. 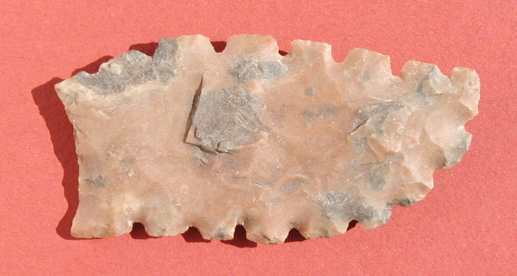 Indians would make a number of blank preforms at the source of the stone and take the unfinished preforms back to camp distant from a source of good stone. Preforms are lighter and easier to carry that raw stone. They could then be used to make whatever tool was needed at the camp. Flakes are the most basic and most often used tool. Easily made by whacking a flake off a chunk of flint, used and then usually discarded they are common and usually overlooked when found. You can tell a used flake from an unused flake by looking for microflaking. When a flake is used, tiny flakes are knocked off leaving a series of tiny serrations. You can feel the microflaked edge more easily than you can see it. Often the opposite edge, where the fingers and hand would have pushed on it, has been ground down and dulled. Flakes can be in almost any shape, but they are usually blade shaped. Knives are often mistaken for points. They often do look like large points. Knives come in all shapes and sizes. 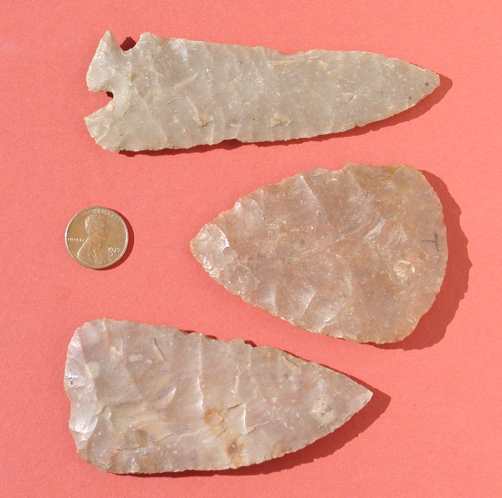 Indians used them pretty much the way we use modern steel knives - but stone knives are much more fragile. They break easily. Knives sometimes have notches on them to attach a wood handle. Points. Look at more points. Points go on the tips of arrows and darts. Small points like these are from arrows. 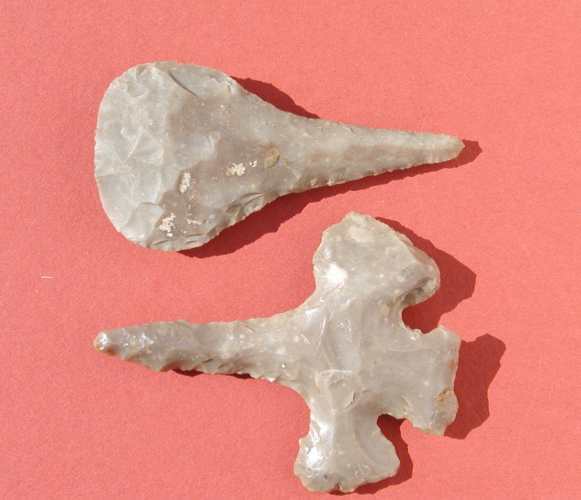 Large points are usually from atlatl darts. Really large points are usually knives and not points at all. The bow and arrow did not arrive in Texas until around a.d.400. 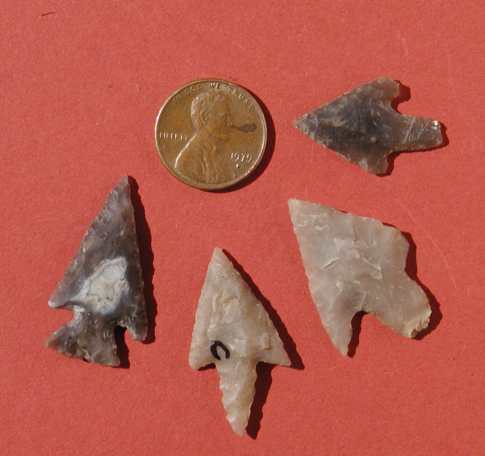 So arrow points are newer and larger atlatl points are older. Contrary to popular belief, Indians did not use many spears. Trying to kill a large dangerous animal such as a buffalo was too dangerous with a spear. You have to get too close to the animal. So larger spear sized points are not points at all they are usually knives. Choppers are another easily made tool. 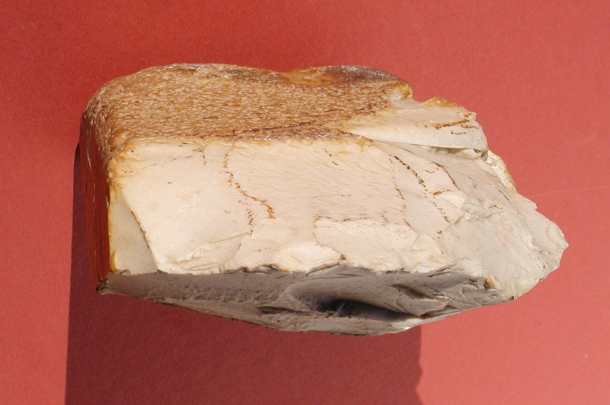 A flint cobble would have flakes knocked off of one end to create a cutting edge. The other end usually fits nicely in the hand. The cutting edge is often battered with crushed edges. Choppers were often quickly made and discarded after use. Choppers come in all shapes and sizes. Drills and awls were used to make holes in things. They are usually about the same size as points. Often drills are made from old points. Indians would use them to make holes in wood, shell, or any softer material. Awls were used to make holes in leather. Often the same tool was used as a drill and a awl. Sometimes awls were made from bone and looked more like big needles. Saws were used to saw soft materials such as wood. This saw is basically a knife with teeth. Denticulate means "toothed". Archeologists use this term to describe any tool with teeth on the edge. This "saw" would have probably made a pretty good scraper for certain tasks. While saws are usually blade shaped, they can be almost any shape. Some are nicely worked like this one, others are cruder with simple teeth quickly worked onto the edge of a flake. The teeth on stone saws are fragile like glass, so stone saws do not work very well as the teeth break off easily. These axes were made by grinding and not chipping. 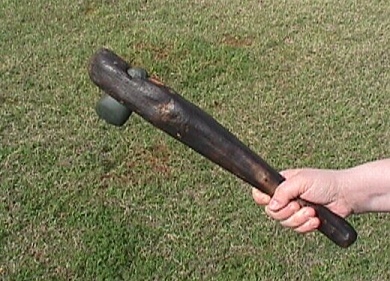 You can see how they were "hafted" into a wooden handle. They are not very sharp. Cutting wood with them must have been a lot of work. Look for more of them on the Caddo Indian page. Thanks to the Sophienburg Museum in New Braunfels Texas for sharing their collection of artifacts for most of these photos. All the photos with pink backgrounds are from the Sophienburg Museum. If you are ever in New Braunfels you can go see the larger collection on display at the museum. Copyright by R. Edward. Moore and Texarch Associates, all rights reserved, 2004, 2012. Graphics may not be used or reproduced without prior permission. Short parts of text and one or two pictures may be used in school reports. Longer quotes require prior written permission.